Klipsch will be hosting a live radio station titled WPWK that will broadcast from a booth within the Klipsch exhibition space (Las Vegas Convention Center, Central Hall Booth 10428) at the 2015 Consumer Electronics Show for its duration, January 6th through to the 9th. So how will this radio station work? Back in the day, I was Program Director of one of the biggest college radio stations, WNYU. As we were based in New York City, we were often asked by big music and radio conventions such as the New Music Seminar and CMJ to broadcast live from the conferences. Artists who happened to be strolling by were quickly pulled in for an impromptu on-air chat, so we had to be on our toes. Imagine my surprise (and fear) when it was announced that one of my musical heroes, Lou Reed, was coming into the booth for an interview in five minutes time. Inwardly I was panic-stricken but I kept it together and luckily experienced the less cantankerous Lou. I cannot even remember our conversation as all that seemed to matter was that he was pleasant. Klipsch WPWK booth being built for CES 2015. Thankfully, for WPWK we have scheduled some fantastic guests in advance. On the artist front, Marky Ramone will be joining me to play some of his favorite tunes and discuss the good ole days at CBGBs and the band for which he is the last remaining member. Another one of my guests will be master engineer and producer Eddie Kramer. Eddie has worked with some of the biggest names in the business: The Beatles, Led Zeppelin, Jimi Hendrix and Kiss just to name a few. We will have a chinwag about what it was like working in the studio with these legends and of course we will examine some of their most popular tunes. Steve Dobo of The Rock and Roll Hall of Fame will be dropping by to discuss the concept behind the museum and this year’s nominees which run the gamut from rockers like Joan Jett to funk masters like Chic and electronic pioneers Kraftwerk. 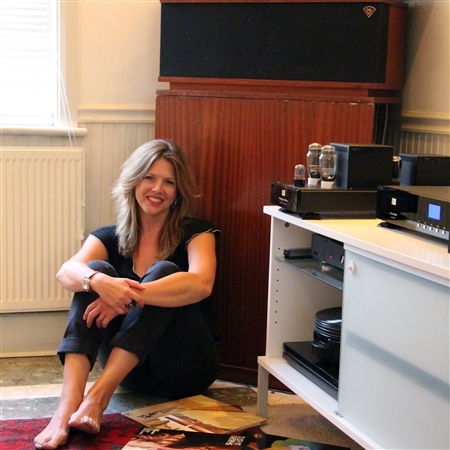 Colleen 'Cosmo' Murphy will host music and audio legends live at CES 2015 from the Klipsch WPWK Station. I will also be joined by another legend in sound: Bob Heil. Bob and I will discuss how he developed one of the first rock concert PA’s that was used by luminaries such as The Grateful Dead and The Who, how his Heil Talk Box was famously utilized by Joe Walsh and Peter Frampton, and his microphone that can be seen on the stages of artists like Beck and Outkast (we are using his mics at WPWK, as well). Bob will also reflect upon his personal relationship with Klipsch founder Paul W. Klipsch who was both an inspiration and mentor in Bob’s early days in the business. Paul even modified a Klipsch La Scala for Heil Sound as a stage monitor for Jeff Beck. WPWK will host some programs with Klipsch Historian, Jim Hunter, who will shed some light on the man behind the legend. Paul himself hired Jim as a designer thirty-six years ago, so it is safe to say this guy has first hand knowledge of Paul’s genius and his array of obsessive interests such as the model steam engine he researched for 23 years before building. Not only did Mr. Klipsch help revolutionize the world of audio and acoustics, but our beloved eccentric also held patents in the areas of geophysics and ballistics. Suffice it to say there is quite a story to tell. Even though his loudspeakers were used by some of rock’s cream-of-the-crop (Jerry Garcia and Bob Dylan to name a couple), Paul W. Klipsch was more of a ‘reluctant rocker’. Therefore, we would like to ensure that he would be (loud and) proud of our musical efforts. To this effect we will be featuring some of the music that Paul recorded now known as The Klipschtape. Staff musician and organist John Eargle is featured prominently on the tapes, and they were used extensively as demonstration material for the audio shows. The quality of phonographs at that time could not keep up with the quality of the Klipschorn, so Paul decided to sort it out himself. On another interesting note, Paul developed one of the first variable reluctance phonograph cartridges but his former employer, General Electric, beat him to the patent office by only months. And of course, let us not forget the reason we are here in the first place: the products. We have dedicated quite a bit of airtime to discuss the Klipsch Heritage Series, floorstanding speakers and headphones as well as new products with the latest technologies launching on site at CES 2015. Finally, on Friday I will wrap up with a show centered upon one of my favorite topics: classic albums. I will have a natter sprinkled with interesting anecdotes behind some of our most beloved albums and will play songs from some of my personal favorite platters. Expect to hear something from Love ‘Forever Changes’ (but that is all I am willing to give away at the moment). If you are heading to CES, we hope you will be able to join us for some fun and stimulating banter and some cool tunage on WPWK. We will be recording these radio shows so for those of you unable to witness our live broadcasts at CES, do stay tuned at ces.klipsch.com. Thanks for listening.